The midterm elections left the U.S. with the House of Representatives controlled by the Democrats, Republicans tightened their hold on the Senate, and President Trump has the bully pulpit and veto power. That is a formula for real bi-partisan compromise or a government that will have trouble just passing a budget. I will be a skeptic until proven otherwise. On the stock market front, a deadlocked government means that stocks will be evaluated more on their fundamentals, and not on whether new government policies will help or hurt. It will be a good time to be a dividend focused investor. 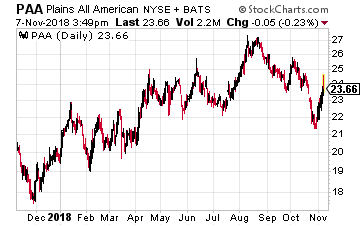 Here are three ongoing economic trends and an income stock that is a way to play each trend. The Federal Reserve Board will continue to increase short term interest rates. The Fed’s primary goal is to keep the economy from overheating and bring on a high level of inflation. Higher rates will also give the Fed the tool of rate cuts to soften the next recession. Out in the real world, higher interest rates mean that the recent trend of the preference to rent housing vs. buying a house will continue. Among those that rent, 78% of tenants believe that renting is more affordable than owning, up significantly this year. 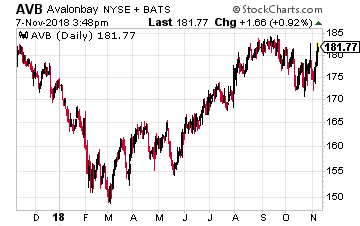 AvalonBay Communities, Inc. (NYSE: AVB) is a large-cap apartment REIT. The company develops, owns and manages apartment communities primarily in New England, the New York/New Jersey metro area, the Mid-Atlantic, the Pacific Northwest, and Northern and Southern California. As of the end of September Avalon had direct or indirect ownership interest in 290 apartment communities containing 84,490 apartment homes in 12 states and the District of Columbia. Another 34 communities were in development or redevelopment. For the 2019 third quarter, the company reported same store net operating income growth of 3.1%. Average blended rent growth was 3.2%. These are strong, sustainable numbers. The AVB dividend has a five-year average annual growth rate of 8.0%. The current yield is 3.3%. Growing energy production from renewable sources is supported across the political spectrum. Another factor is that the cost of development of wind or solar power facilities has declined to a level where they are competitive with construction of new traditional fuel power plants. This means that new renewable energy projects do not need government subsidies to compete. Yieldco types of companies are the final owners of many renewable energy projects. These are great income stocks with built in growth prospects. 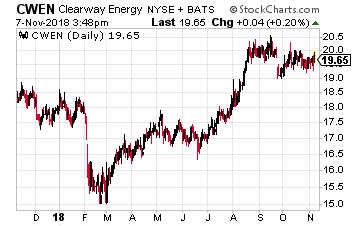 Clearway Energy (NYSE: CWEN) is a renewable energy Yieldco where the controlling party recently changed. Clearway was founded as NRG Yield by utility company NRG Energy (NYSE: NRG) and the utility developed renewable projects to sell to the Yieldco. In August 2018 NRG sold its sponsor interest in NRG Yield to Global Infrastructure Partners (GIP), a private investment company that makes equity investments in a range of infrastructure assets. The change of control does not affect Clearways prospects to continue annual 5% to 8% dividend growth. Renewable energy is growing, but so is U.S. onshore crude oil production. The growth in oil production from the Permian Basin is truly amazing, going from one million barrels per day in 2011 to 3.5 million bpd in 2018 and a forecast 3.9 mbd in 2019. I have seen forecasts of 7 mbd by the middle of the next decade. The limiting factor to this oil gusher is pipeline take away capacity to refiners and the Gulf Coast export terminals. The region needs over one million barrels per day of new pipeline capacity – which will come on line in late 2019. By then more pipeline capacity will be needed. Plains All American Pipelines LP (NYSE: PAA) is the largest independent owner of crude oil gathering assets, pipelines and storage terminals. The company just announced its newly commissioned Sunrise Pipeline is transporting 300 to 350 thousand barrels per day of crude oil out of the Permian to the Texas Gulf Coast. The Plains business model lets it often collect several fees from a barrel of oil. These can be gathering charges, pipeline fees on more than one pipeline, and storage fees. This MLP has gone through significant restructuring since the energy market crash of 2015-2016 included a pair of distribution reductions. The 2018 third quarter earnings report shows the company is back on a growth trajectory and should start growing dividends in 2019.